We know it’s impossible to keep up with all of the news in the local business space. That’s why we’ve cherry-picked the articles from this week that matter most for business owners like you. You've started your own business. Now, you need to make your business visible online to attract customers, and you need to position yourself as an expert in your industry so that customers trust you and your product. Thankfully, having a good content marketing strategy tied with a strong understanding of SEO can help you accomplish those goals. Keep a blog. Many people hear "content marketing," think of the marketing funnel, and they psych themselves out. As a young, small business, maintaining a daily or weekly blog that simply discusses your industry is great first step. Make sure to use industry keywords to rank higher on Google. Keep in mind this is a long-term commitment, and won't produce results over night. Social Media is a must. Social media is crucial to your online presence. Create social pages and share your blog to enhance your SEO efforts and your online reputation. Images and video. The world of shared media is changing rapidly. Images have taken over from plain text as the strongest way to communicate, and it seems that we are now headed towards video being our preferred form of communication. Both are known to attract a large audience, and when title tags and alt tags are optimized with great keywords and a local focus, they can improve search engine rankings. Cultivate online reviews. Yelp, Google+, and others exist to facilitate your business' online presence. Consumers will search for your business online before they make their purchase decision. Your online reviews should leave them dazzled and with no choice but to try your product or service! Encourage happy customers to write reviews when you can — asking a simple question can go a long way towards SEO success. Stay consistent. With SEO, you need to be consistent above all else. Make sure your NAP (Name, Address, Phone Number) is the same everywhere online, as that is one of the main ways search engines categorize your business. Why It Matters: When making a purchase, you probably go on Google to check out the product/reviews first. Well, your customers do the same. Follow the steps outlined above to ensure that your customers find you online, recognize you as an industry expert, and are excited about your product or service because of all of the 5-star reviews! As a small, local business, maintaining a strong presence online may seem daunting. However, keeping a weekly (or daily) blog doesn't take a ton of effort and can have a tremendous impact on your customer base. Your content will hopefully help you build influence, strengthen your relationship with existing clients, and help you attract new ones. Navel gazing. Don't talk too much about your product or service. Establish yourself as an industry expert and create useful content that solves problems so that when people need help, they turn to you (and your product or service). Not posting enough. A blog is a long-term commitment. Build a routine and follow it. If you start by writing blogs once a week, that's what your followers will expect — don't deviate and give them a reason to look elsewhere. Not telling people about it. Email marketing, social media, and even word of mouth apply here. Share, share, share, and start planting the seeds of what will hopefully be a loyal follower base. Why It Matters: Be a problem solver. If your blog focuses on customers' pain points, and addresses them to find solutions, people will flock to you for help. If they're coming to you, that's the ultimate sign of a successful blog strategy. It's 2015 – no one wants to slog through another email on their phone that isn't formatted, has URLs that take up the whole screen, or an image that takes 10 minutes to load. Making your emails mobile-friendly will go a long way towards a successful email marketing strategy. Provide a clear CTA (call-to-action). Be clear and concise in content and design. Use plenty of white space. Take it easy on images. Why It Matters: Email marketing is still the cheapest way to reach your audience. But with people increasingly relying on their phones instead of their desktops, you need to make sure you're optimized (not only your emails, but your website as well!) for mobile so customers can have the optimal experience when interacting with your business. Eitan Katz is a seasoned Social Media Marketer and Online Writer. He's managed the social accounts of EA Sports and the National Basketball Association, worked as a community manager at Uber, and was a featured columnist for Bleacher Report. He currently works at Booker Software, where he runs Social Media, maintains the Booker Blog, and hosts a Booker-themed web video series called "On the Road with Eitan." Is your spa software supporting the success of your business? Make sure it does by following these easy steps. 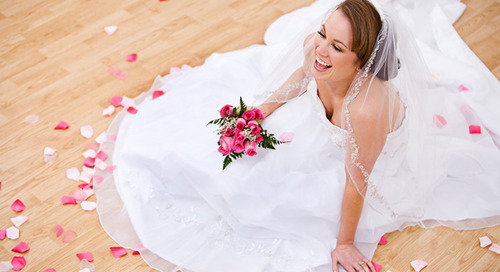 The start of bridal season marks a huge sales opportunity for spas.